Many congratulations to Baoyuan Chow, a saxophone student of Phil Hatton’s! Bao started with the Lions Youth Music Program 7 years ago and has won a scholarship to the prestigious Berklee College of Music in Boston, Massachusetts. Berklee is the largest independent college of contemporary music in the world and considered the world’s foremost institute for the study of jazz. This is a fantastic achievement for Bao, and a tribute to his teacher Phil. 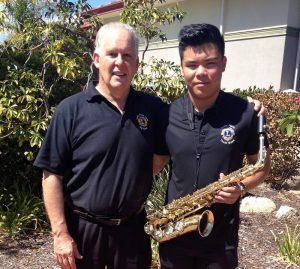 The South Perth Lions Club is proud to have had Bao in the Youth Music Program and we wish him happiness and success in the USA.